We have noted previously on this blog that natural gas prices have declined dramatically over the last three years. On January 19, 2012 the February futures contract settled at $2.32 per million Btus. This is lower than natural gas prices have been in a decade and we are in the winter heating season, a time when prices generally rise. Adjusted for inflation, prices have not been this low since late 1998. 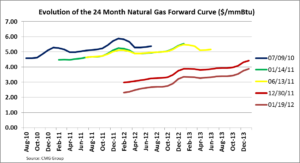 Looking ahead, the graph below shows the evolution of the twenty-four month natural gas futures curve over the last year and a half. It may seem counterintuitive, but as the futures curve has dropped it has remained upward sloping. In other words, as natural gas prices have declined, the market has continued to expect prices to rise in the future. Several readers have asked what the major influences on natural gas prices are. Natural gas is very much a commodity and, as such, its price at any point in time is subject to the economic interaction of supply of and demand for natural gas. For our purpose here we have identified a number of influences and grouped them into those that create upward pressure on natural gas prices and those that will continue to moderate natural gas prices. This list is certainly not comprehensive but should serve as a good starting point. We will discuss these influences in this and future blog posts.